Christmas is the birth of Jesus. And right behind that is Charles Dickens story, A Christmas Carol. For me, anyway. One is the reason for the season and the other is the spirit of the season. 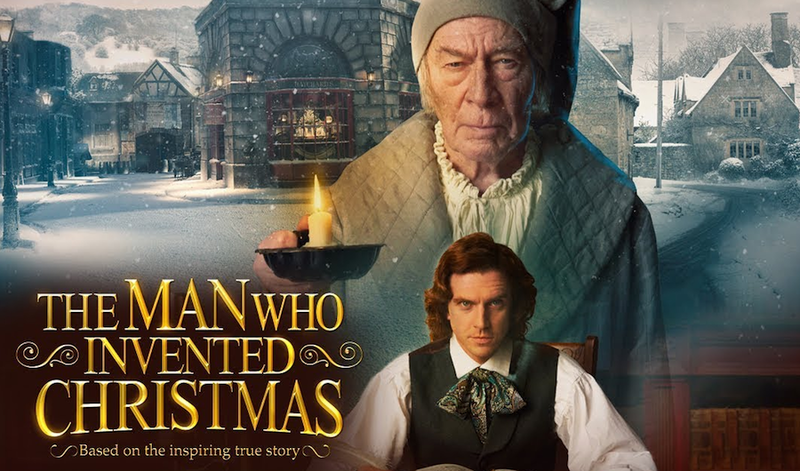 The movie The Man Who Invented Christmas, opening in theaters, Friday, November 22, chronicles the story behind the classic Christmas tale. It’s a Dickens’ story to be sure, with all the drama, harshness and delight of Jolly Old Victorian England. The movie is about the real life events of how the novella Dickens published in 1843 came to be published at all—let alone in just six weeks. Despite earlier success in the 1930s with his books Oliver Twist and The Pickwick Papers, which brought him international acclaim, Dickens’ career had slumped. But as the movie reveals, it was more than a bit of writer’s block; it truly is a Dicken-esque story. The film blends the classic Christmas story into Dickens’ real-life struggles to overcome a painful childhood when he was forced to work in a shoe blackening (polish) factory after his father was sent away to debtors prison. He was a poor boy who made good but then his past and his present collide. Dickens’ life becomes frenzied, as any writer relying on the next check could understand. He pitched the idea of a “Christmas ghost story” to his publisher who was not interested. Dickens feels certain his idea would captivate readers so he decides to publish on his own even though the story was still just being fleshed out and he struggled with an ending. Fiction and reality overlap as one by one the characters come to life, coming in and out of Dickens’ own life as he gets to know them—the crotchety, mean Ebenezer Scrooge, Tiny Time and others. Meanwhile, Dickens tries to keep his head afloat amid personal turmoil. Only days before Christmas, he completes his story and the rest, as they say, is history, or rather in this case, a Christmas classic. It was not only a hit, but sold out within days. The story not only reawakened Dickens’ career but also reinvigorated Christmas. The book’s message of giving substantially spurred charitable donations that year among the Victorians and has continued to touch hearts for generations to come. The move stars Legion star Dan Stevens as a young Dickens, Christopher Plummer as Ebenezer Scrooge, and Jonathan Pryce as Dickens’ father. It is rated PG and opens in theaters November 22.